Another business trip. Usual. To Kolkata. Very unusual! The trip was held hostage until the last day due to the Jet Airways strike and other intrigue in the workplace, but I am glad I made it to Kolkata; the trip was well worth the time I spent. 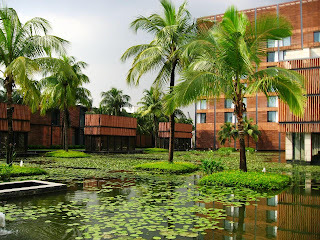 The ITC Sonar Kolkata brings to life the mood of the colonial era with its sprawling homes and gardens along the Hooghly River. And to tantalize the food buds in a city known for its culinary sophistication, the Sonar Kolkata has some of ITC's best, including Dum Pukht, Pan Asian, Peshawari. Having loved the food of Dum Pukht at both New Delhi and Mumbai, I decided to try their Kolkata namesake as well. Dum Pukht recreates the 200 year old legacy from the kitchens of the Nawabs of Awadh, show-casing the culinary tradition of dum cooking - a style of cooking food over slow fire in sealed deghs - that has regaled connoisseurs from the world over. Characterized by the subtle use of spices, this restaurant brings to life the culinary sophistication of the nawabs. They offered me a 'bespoke menu', a tailor-made menu that allowed me to taste multiple dishes in smaller portions. The feast began with multiple exquisite kabab offerings. The Jhinga Dum Nisha, jumbo prawns marinated in cheese and hung yogurt, is flash cooked in a tandoor before being finished on 'dum'. Excellent stuff, the crunchy fresh prawns combined with the heady but delicately fragrant spices making for a great beginning. The signature Dum Pukht Kakori, a delicate melt-in-your-mouth kabab of finely minced lamb flavored with cloves and cinnamon is wrapped around a skewer and char grilled. This exotic kabab's origin is the stuff of many stories. The kabab - served on a ulte tawa ka paratha -was excellent, even if it tasted different from that in The Great Kabab Factory. 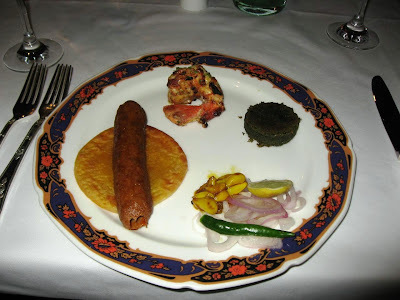 They rounded this platter with a Hara Kabab, made of spinach, spices and cottage cheese. There was also some garlic achaar that I hadn't run into for a long time. Next came the Murg Rizala, a dish of boneless chicken stuffed with herbs and chillies and dum cooked in a gravy of yogurt with a hint of almonds and garnished with egg white, bell peppers and tomatoes. I enjoyed the sharp tang of fresh green chillies in this dish - very unique. The Subz Miloni stood out too - a melange of seasonal vegetables cooked in a smooth green puree of spinach and fenugreek. The dish was simple, but expertly cooked! 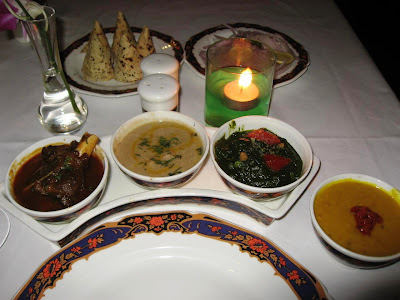 The Dum Pukht Koh-e-Awadh was a chef's special qorma of elegantly exposed lamb shanks that were dum cooked in their own cardomom tinged juices and marrow and finished with saffron. Pretty good, but the richness of the gravy made it difficult to finish. Incidentally, qormas, qualiyas and salans were the three classification of Mughlai gravy dishes: while qormas were thick gravy preparations that frequently used pastes of dry fruits, qualiyas were lighter with haldi - turmeric paste - as a key ingredient. Everything else was classified as salans, even thoough the ones in Hyderabad are characterized by peanut paste. Finally, I have to mention the Dal Dum Pukht, a yellow dal of arhar cooked with yellow chillies, yogurt, and tempered with caramelized garlic, that last ingredient enhancing the magic of this dal considerably! 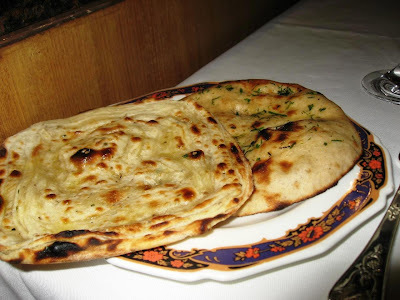 The Khaimiri Roti and Warqi Paratha - two exotic Indian breads - were excellent and prepared fresh. There is so much variety in Indian breads, but some - such as the ones I tasted tonight - are not easily found. It was time to try their speciality, the Dum Pukht Biryani and I was already full. I had to try a few spoonfuls of the fragrant basmati rice that had been simmered with mace, itter and kewra before being finished in a sealed handi. 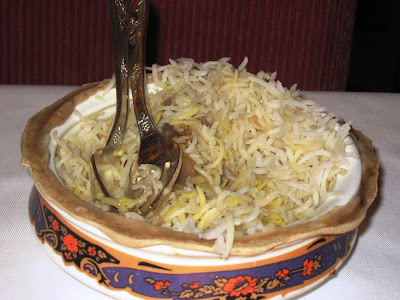 The biryani, prepared in the Lucknow style, is distinct from its Hyderabadi cousin. The Kulfi Lub-e-mashooq ended the elaborate meal. 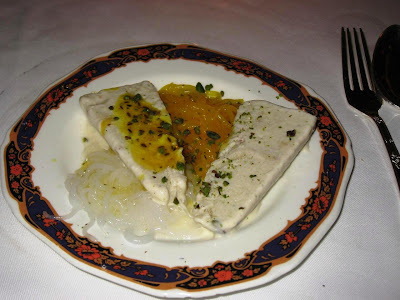 This creamy saffron and pistachio kulfi was served with falooda - wheat starch noodles - and a herbal syrup. The Dum Pukht is open all the way up to 11:45 PM which allows you to have a leisurely meal - the way kababs and biryani are meant to be enjoyed. Among the three locations, I have found the ones at Delhi and Kolkata more vibrant and lively than their namesake in Mumbai. thank u so much for finally posting abt Kolkata food though I have not visited this place so far -did u have bhapa sorshe ilish by any chance.i love the Cal Lucknowee biryani n love preparing that at home.And yes did u hv the raj bhogs n kamala bhogs n mishti dois n shod bhajas.Cal also has excellent chinese restaurants besides Mainland China..
@Anu: Oh yes, did have kamala bhog, mihidana and mishti doi in Kolkata. 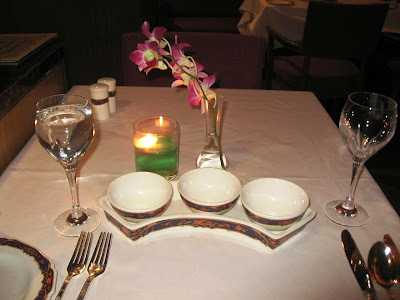 Watch this space for a review of Aaheli - the Bengali speciality restaurant in the Esplanade area. @Chris: And the taste is every bit as heavenly. @Anu: I have now published my review of Aaheli. Didn't have much time from business for much else. @Harekrishnaji: Glad you think so! SO craving Indian food right now. Those kakori looking kebabs look phenomenal. @Avishek: Thanks. I would think so!